American Ninja Warrior, NBC’s obstacle course competition airs tonight with an all new Monday, September 7 season 7 episode 15 called “Vegas Finals.” We’ve got your recap down below! On tonight’s episode In Las Vegas, the remaining finalists take on Stage 1 of the four-stage course modeled after the Mount Midoriyama course in Japan, with new obstacles Sonic Curve and Double Shock. Those that finish move on to Stage 2. For those of you who don’t know, the action-packed series follows competitors as they tackle a series of challenging obstacle courses in both qualifying and finals rounds across the country. On the last episode American Ninja Warrior” traveled to Las Vegas, Nevada where the top finishers from the regional finals tackled the ultimate challenge – a four stage course modeled after ‘Mount Midoriyama’ in Japan. Competitors will attempt Stage One, with new obstacles the Sonic Curve and The Double Shock. The finalists vied to win a cash prize of $1,000,000 and the title of “American Ninja Warrior. Did you watch last week’s episode? If you missed it we have a full and detailed recap, right here for you. 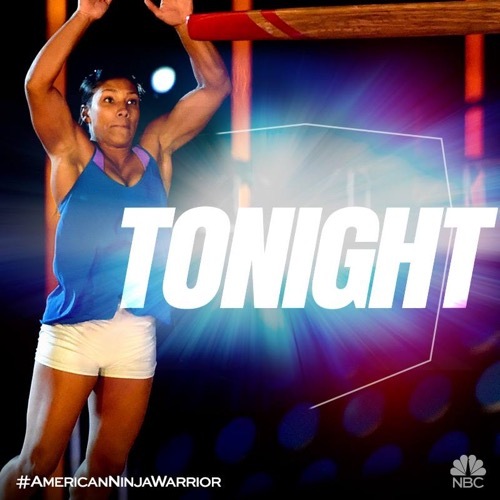 Tonight’s episode looks like it is going to be great and you won’t want to miss it, so be sure to tune in for our coverage of NBC’s American Ninja Warrior at 9:00 PM EST! While you wait for our recap hit the comments and let us know how excited you are about the show so far. #AmericaNinjaWarrior is in Vegas for the second part of the Vegas finals. Tonight’s course is eight obstacles in stage one that must be completed in two and a half minutes. There’s Piston Row, the Propeller Bar, Silk Slider, Jumping Spider, Sonic Curve and then the Warped Wall with the shorter run up then the Coin Flip and the Triple Swing up to the buzzer. Walk on Adam Arnold is first up tonight. He did very well in Orlando and was the top finisher in the city finals. He starts his run with an easy run past he pistons but he loses his grip on the Propeller Bar and he fell when he tried to grab the rope too soon. Next is Olympic luger Preston Griffall. He makes it past the Propeller and to the Silks. He sticks the landing and moves on. Now is the Jumping Spider. He almost slipped but recovers and presses on. Now it’s the Sonic Curve and he makes it through and now it’s the Warped Wall. He sits to catch his breath and then flops on the wall three times then makes it the fourth try. He has to pick up the pace and has 30 seconds for the Triple Swing. He falls on the last obstacle with a bit of time to spare. Over the break Asya Brechka fell on the Propelle Bar, Adam Mihm went out on the Jumping Slider and Steve Martin went out early on the Pistons. Now it’s Jonathan Parr, physical therapist from Texas, on the course. He makes it past the first two and onto the Silks. He moves on to the Spider and almost slips but recovers and moves on to the Sonic Curve but misses the last step and goes into the drink. Flight attendant Grant McCartney is next and he dances at the starting line. He runs the Pistons easily then moves to the Propeller and grabs the rope in one jump. He’s on the Silks and sticks it. He moves to the Jumping Spider and starts to slide but gets it back and locks in and moves on but struggled. Now it’s the Sonic Curve. He makes it easily and it’s on to the Warped Wall. He runs it easily and has 44 seconds as he heads to the Coin Flip. That’s no problem and he’s got 30 seconds when he hits the Triple Swing. He lands on the cargo net with 17 seconds. He slaps the buzzer with nine seconds left. Next up is Rose Wetzel a top Spartan racer. She almost falls on the Pistons and recovers. No woman has ever completed Stage One of Vegas. She tests the mini tramp then runs it. She can’t get high enough to hit the Propeller Bar and she’s out. Women have a hard time getting a high enough jump to snag it because they don’t weigh enough. Next up is Captain NBC Jamie Rahn. This is his third time in Vegas. He runs up one side of the Pistons then heads for the Propeller. He completes that easily. Now he’s on the Silks and nails that too. He goes into the Jumping Spider easily which took him out last year. He makes it through. Now he’s on the Sonic Curve and misses the first landing then a second before he gets his feet down. He runs the wall and has 53 seconds left. He runs the Coin Flip perfectly and now it’s the Triple Swing. He slaps the buzzer with 12 seconds left and he’s the second finisher with the fastest time. He puts a little green wig on the buzzer. On the break, Van Tran fell short on the Propeller, Eddy Stewart went out on the Warped Wall when his time ran out then Brandon Mears slapped the buzzer to finish. Firefighter Brandon is the tallest competitor to ever finish stage one. Paramedic Brendan Couvreaux is next up. He was one of only three finishers in Kansas City. Brendan goes out on the Propeller. He just couldn’t hang on. Next is exterminator Pavel Fesyuk. He makes it past the first two and moves to the Silk Slider. He nails that and heads for the Jumping Spider – he said he was worried about this one. He nails the entry but his shoes are sliding and he’s struggling and going slow but makes it. He heads for the Sonic and nails that too then it’s the Warped Wall which he misses the first time then gets it. He moves on with 42 seconds. He hits the Coin Flip and barely makes it past. He’s got less than 30 seconds on the Triple Swing. He makes the net and has just 10 seconds left. He hit the buzzer with less than one second left but will move on. On the break, Geoff Lancaster went out on the Sonic Curve, Benjamin Barrett fell short on the Triple Swing and rookie Sean Clayton hit the buzzer. Next up is Ninja trainer Josh Cook who is a three time Vegas appearance and made it to Stage Two the last two times. He clears the Pistons and the Propeller but the Propeller hit him hard. He moves to the Silks and he falls into the water well short of the landing pad. It looks like the hit he took to the head was the problem and he just lost his grip disoriented. The human panther Anthony Scott takes the Pistons and the Propeller keeps spinning. He goes around at six times and loses time. He moves to the Slider and nails it. He dries his feet before moving to the Jumping Spider. He sticks it and moves on. Now it’s the Sonic Curve and grabs the Warped Wal. He’s got 54 seconds to go. The Coin Flip is easy and he’s on the Triple Swing. Scott has never finished a Ninja course before and grabs the cargo net with more than 20 seconds. HE slaps the buzzer with 10 seconds left. Now it’s time for Lance Pekus’s run and Matt and Akbar have to put on the cowboy hats for his run per their bet in the City Finals. Lance is worried about the Jumping Spider which has taken him out in the last two seasons. He clears the Pistons easily and he’s in shorts, not jeans. He clears the Propeller and moves to the Silks. He goes to the Spider and test the mini tramp and then locks in a good position and goes through it fast. Pekus heads to the Sonic Curve but misses the landing the first time. He moves to the Warped Wall and grabs it easily. He’s got more than a minute when he heads for the Coin Flip. He clears that and has more than 52 seconds when he hits the Triple Swing. He climbs the cargo net and hits the buzzer with more than 23 seconds left. Matt and Akbar tip their cowboy hats to him. He says he has more confidence this year and Christine tells him that everyone loves the #CowboyNinja. Next up are some of the toughest competitors. Next up is rock climber Isaac Caldiero, one of the Wolf Pack. He makes it past the first two obstacles easily and moves to the Silks. He nails the landing perfectly and heads for the Jumping Spider. He naisl that and is moving fast. He goes for the Sonic Curve and lands it. He hits the Warped Wall and runs up it with more than a minute left. He hops the Coin Flip and starts the Triple Swing with more than 40 seconds left. He slaps the buzzer with 20 seconds left – a great performance that was almost flawless. He even worked in a dance move and a fist pump. Kacy Catanzaro is next and the crowd is going wild. The little dynamo had a tough time in Houston and went out early but caught a wildcard spot for Vegas. Kacy runs the Pistons but makes a huge error on the mini tramp for the Propeller. She tried too hard to hit it and basically went over it and just fell into the pool. She cried when she came out and cries again for Christine. She says she feels like she keeps failing and it’s hard and she doesn’t want to disappoint people. She says she won’t give up. On the break, Caleb Hayre went out on the Silks missing the pad. Rich Shoemaker fell hard on the Jumping Spider. Ian Dory zoomed right through the course and slapped the buzzer for a second year at Stage Two. Next up is ex-Marine and current US Marshal Jeremy Prather. He misses the rope on the Propeller Bar and he’s out – that’s a shocker. Next up is JJ Woods who completed Stage One last year. He runs one side of the Pistons, takes the Propeller easily and moves to the Silks which he nails. He heads for the Spider and scoots right through it. The Sonic Curve is no problem and he heads for the Wall and clears that with more than a minute left. He hits the Triple Swing with more than 50 seconds. He slaps the buzzer with 32 seconds left. Wow, that was fast – the fastest run of the night and the third fastest so far. Joe Moravsky is up next – in three seasons, he’s had an impressive track record. He made it to Stage 3 in his first year in Vegas and least year made it farther than anyone. He was the fastest runner last year. He hops the Pistons fast then does the Propeller and is on the Silks and lands it. He moves to the Jumping Spider, slides but muscles through it fast. Now to the Curve which he nails as well. He’s up the wall with more than a minute 20 left and hits the Tripe Swing with close to a minute left. He climbs up and slaps it with more than 35 seconds left. That’s tonight’s fastest time and maybe the fastest time on Stage 1 period. Next is the natural Elet Hall. He’s of and running fast like usual and hits the first three super fast and with expertise. But then he goes out on the Spider! He lost his footing and everyone is stunned. The crowd and other competitors are stunned. It looks like he may be hurt. His left foot missed and he tells Christine that he never had trouble with it – he says he was going way too fast. He says he felt his shoulder popping so he fell rather than letting it get injured. He says he’ll keep training and will be back. On the break, local favorite Dustin Rocho hit the buzzer with less than a second to spare. Then Drew Dreschel clocked the fastest time of the night. Wedding photographer Jake Murray is up next and he runs just one side of the Pistons then moves to the Propeller then Silks. He dries his fight before moving to the Spider which he does well. He runs the Curve and then heads for the Wall. He’s up it with nearly a minute and a half left. He may beat Kevin Bull’s fastest course time. He hits the Cargo net with a minute left. The rookie slaps the buzzer with 50 seconds left to shave one second off the fastest Stage One time so far beating Kevin Bill. He jumps down into the water to celebrate. Next is Meagan Martin – one of just four women to get up the warped wall and she made history in Vegas. Last year she was the first woman to beat the Jumping Spider. She ran out of time at the Warped Wall last year. She’s been hanging out with the Wolf Pack to try and improve her speed. She hopes to make history tonight. Meagan starts with her Piston Run. She’s moving slow. The Propeller is the big one – she grabs the bar then the rope and moves to the Silks. She lands it and moves on to the Jumping Spider. She lands it and moves down the wall. She’s got less than a minute. She goes to the Sonic Curve with a two footed technique and makes it. She misses the wall. She misses it three times and her clock runs out. She is stuck at the same spot last year. She was so close. On the break, Brandon Barrett fell out on the Spider. Karson Voiles is a two time Vegas vet and slapped the buzzer. Jeremiah Morgan also slapped the buzzer. Last up tonight is Brent Steffensen. He hits the Jumping Spider with almost two minutes left on the clock. He heads for the Curve and almost falls – it takes him two times to land it. He hits the wall with 1:20 left and heads for the Coin Flip. He leaps onto the Triple Swing with 1:08 on the clock. He hits the net and climbs up. He slaps it with 51 seconds left to make the fastest time of the night and on Stage One. Brent Steffensen is back! He is also the POM wonderful run of the night. Next week is the Season Finale of Ninja Warrior.